Once again we have a card that only works in a certain type of deck. This time, it's a Zombie deck. Pair this guy up with Castle of Dark Illusions and you have a slightly powerful force to be reckoned with, but I'd still go with Shadow Ghoul just for good measure. Introduction: Woah I get to keep on pumping this monser up, bwhahahahh! DEF of this card by 100 points. As long as "Castle of Dark Illusions"
continues until your 4th turn after the card is activated. Illusions on the field, which makes it harder for the pumping to begin. face-down. This is still an average card. Not that bad. days it won't be happy at all. Happy Halloween! 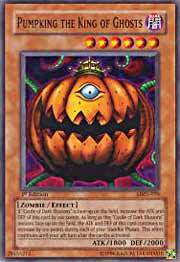 Today, as a fun pick, we are looking at Pumpking the king of ghosts. It's got stats of 1800/2000 which isn't great for a 1 tribute monster. But it gains 100 a turn for 4 turns if the castle of dark illusions is on the field. Simply put, even with the effect, this card is not worth it for 1 tribute. With the Castle of Dark Illusions, it gain go way up to 3000 attack, but it will undoubtably be killed by magic or trap way before you get to that point. I give this card a 3.0/5. It's not too powerful, but if you can protect it with some traps, you can get a monster as powerful as BEWD for 1 tribute.